RRVW has been in the rail car repair business since 1987. Our $1.5 million rail car shop facility was built in 2009, and it is located in Breckenridge, Minnesota. Together our team of specialists have years of experience, and we will provide you with outstanding results. 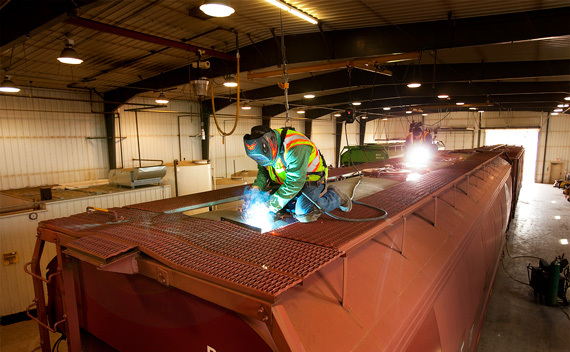 Our full-service facility is also equipped to facilitate interior cleaning and washing of covered hoppers and tank cars. We have several mobile units that we can send to you for your rail car repair and hopper car wash needs. RRVW’s mechanical department prides itself in providing you the highest level of quality work and customer satisfaction. References are available upon request. For a quote on repair work, please contact Dave Volk at (218) 643-8525.